The Cutie Mark Crusaders are going to Fluttershy’s cottage for a sleepover tonight and you’re invited to come along! 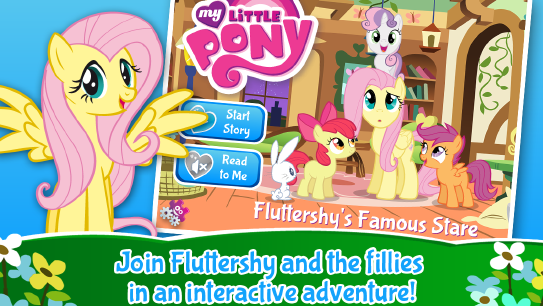 Fluttershy soon finds she has her hooves full as Scootaloo, Apple Bloom, and Sweetie Belle look for ways to earn their hidden talents – their Cutie Marks – by helping Fluttershy. By the end of the night, it isn’t their hidden talents they discover but Fluttershy’s! Read along as the fillies learn a valuable lesson about listening and having patience. Based on the episode Stare Master from the hit animated series FRIENDSHIP IS MAGIC, this adapted story is perfect for early and emerging readers! 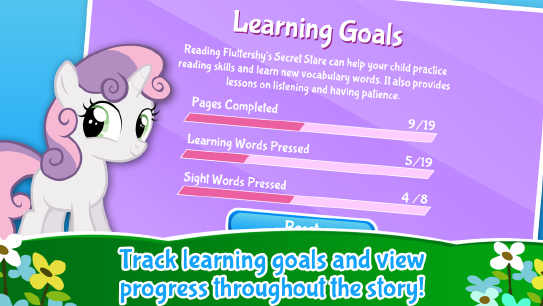 MY LITTLE PONY: FLUTTERSHY’S FAMOUS STARE is the newest, highly interactive storybook app from PlayDate Digital. A springtime fable that is perfect and appropriate for preschoolers, this new storybook app is designed to help emergent readers practice their skills while following the adventures of their favorite characters. 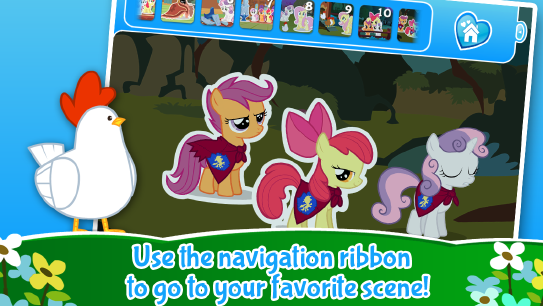 Favorite young fillies— Scootaloo, Sweetie Belle and Apple Bloom!—take over Fluttershy’s cottage! 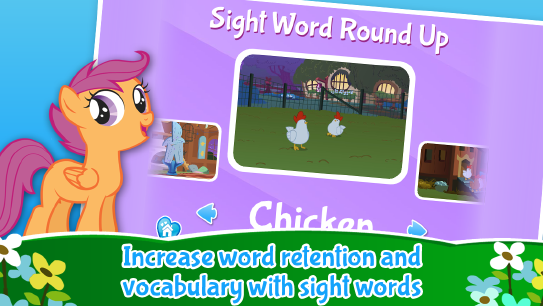 Tap on each scene to bring the ponies and the story to life! New and advanced words are highlighted, sounded out on each page and given meaning through animations. Social/relationship skills – Learn the importance of listening to trusted adults.